I can't tell you how much I love love love this Quilting Bee patterned paper stack from My Mind's Eye! You will definitely be seeing more of it on my blog (no pun intended). The solid cardstock is dry embossed with the Darice 5x7 Honeycomb folder. The sweet sentiment is from My Creative Time's Just A Little Note To Say... stamp set. I stitched around the edge of the card using a decorative stitch on my sewing machine. If you haven't already, please stop by The Fantabulous Cricut Challenge Blog to see the other fabulous DT projects. They are amazing!!! Beautiful card and that paper is fabulous!! Can't wait to see more of it! I am seriously in LOVE with this card!!Beautiful!! The stitching is AMAZING! !AWESOME job! 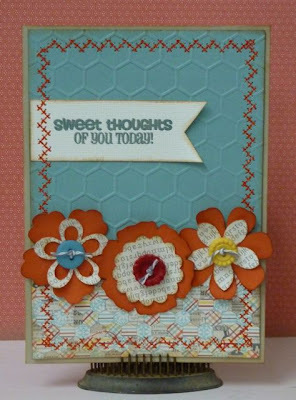 Love the quilt look of this card and the colors you selected. Beautiful, love the flowers and the stitching is fab. I love, love, love the embossing! This card is great! This looks terrific! I really like the embossing and the row of stitching!! Great card! The stitching is fantastic and looks great with the pattern paper and embossing! Wow-I think the stitching is fab! The MD Bouquet is one of the best flower carts! Love your card and the papers.